Before restarting operations at Tiguentourine, Washington and London demanded a major restructuring of its security by Algeria. By Rob Prince, January 27, 2014 . 1. With Washington and London by his side “in spirit” – Bouteflika initiates one of the biggest purges in modern Algerian history. A year after the attack on the Tiguentourine natural gas processing complex, in In-Amenas commune within the Illizi Province of Southeastern Algeria, the consequences of those events are still reverberating. Under intense pressure from the United States, Great Britain and Norway the Algerian government has been forced to make major concessions to international oil companies. 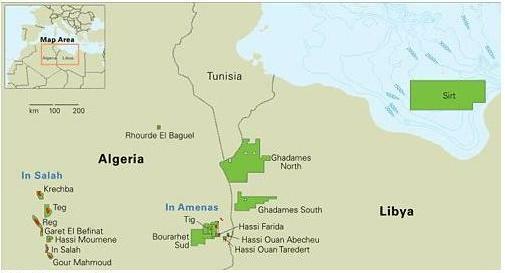 Tiguerntourine is run jointly by British Petroleum (BP) and Statoil (the Norwegian state oil company) in conjunction with the Algerian government’s energy company, Sonatrach. According to an open letter written by Hocine Malti, a former Sonatrach vice president and author of a major work on the Algerian energy industry, after having conducted their own investigation of the incident, the Americans and British pressed the Algerian government to undertake a major purge of high ranking military and security personnel responsible for insuring security at Algerian oil and gas facilities. Before restarting operations at Tiguentourine, Washington and London demanded nothing less than a major restructuring of the Algerian military and security apparatus and were apparently “persuasive enough” to get most of what they wanted. The affair is an indication of the degree to which the C.I.A., MI5, et. al. have been able to dictate their terms to the once proud Algerian military and to increase their influence over the Algerian military and security apparatus. Sometimes together, often in conflict, these two bodies have, despite some appearances, run the country, control, and essentially disperse the country’s extraordinary oil and natural gas wealth at the expense of the social welfare and overall economic development of the country. It was a surreal scene to see Algeria’s president, Abdelaziz Bouteflika, sign the orders eliminating – virtually decapitating – much of the country’s military leadership. Bouteflika, who had just returned from France for medical treatment, was so weak he could hardly lift the pen to sign the decree. That he had the physical and intellectual strength to organize such a political coup does not seem plausible. But Bouteflika compensates for his weak base within Algerian society by the backing of his long-time ally and defender, France. France itself got strong support from the Americans, British and Norwegians. It is not possible to tell at this point what kind of pressure this quadruple whammy exerted upon the Algerian power elite, what threats were made, what possible revelations might have been exposed. But whatever, if, technically, it was Bouteflika’s pen that initiated the sweeping order, his poor health was bolstered by the political support he knew he enjoyed from Washington, London and Oslo, without which his order would have been laughed at and quickly reversed. Many key high level military figures were “retired,” among themAthman Tartag, Abdelmalek Guenaïzia, Rachid Lallali, Ahmed Bousteila, Fewzi and M’Henna Djebbar. The head of the Département du renseignement et de la sécurité (DRS), the country’s dark secret service, Mohamed Mediene, barely managed to cling to his position. Furthermore, BP and Statoil have demanded that the Algerian security of the plant be replaced by foreign private security firms of their own choosing, compromising Algeria’s sovereignty to a degree, perhaps unparalleled since independence. It was almost exactly a year ago – late January of 2013. It began on January 16th when a group of about 30 Islamic militants attacked and temporarily seized the huge Algerian natural gas complex at Tiguerntourine. The plant, which accounts for some 10% of Algerian natural gas production, is located 800 miles southeast of Algiers, the Algerian capital, and within 35 miles of the Libyan border. Some 700 Algerians and 130 foreigners were employed at the site. The incident sent shock waves through the entire global energy production network, underlining the dangers associated with oil and gas production in politically unstable regions When the siege was over, with the Algerian military storming the facility, some 114 people lay dead with the number continually rising. Among the casualties were more than 57 foreign employees. Foreign casualties included ten Japanese, a number of Filipinos, Rumanians, and British citizens. Although the Algerian government immediately claimed that the attack was the work of Islamic fundamentalist radicals tied to or close to Al Qaeda in the Maghreb (AQIM), the official version of events began to unravel almost immediately. How could a group of militants cross hundreds of miles of Sahara desert from Libya and/or Niger without detection? The attackers had detailed plans of the Tiguerntourine facility suggesting at the very least some kind of insider information. The Algerian military presence in the region is significant and they pride themselves on their ability to protect oil and gas facilities, none of which were successfully attacked during Algeria’s cruel civil war of the 1990s. While the United States and Britain – as well as the Algerian government – tried to publicly brush the issue under the rug as quickly as possible, privately both the C.I.A. and MI-5 did their own investigations. My hunch is – not verifiable, I would admit – that both intelligence organizations took the allegations of Souaidia and Keenan quite seriously while of course, writing them off as conspiracists and loonies – especially Keenan in UK – publicly. Yet in the end, Washington and London essentially shared the Souaidia-Keenan hypothesis that at Tiguerntourine, the DRS had overstepped its bounds. Interesting way of putting it? It suggests that as long as the DRS, with a long history of treachery, torture and assassination of any and all manifestations of mass protest, is killing Algerians, their activities can be – and have been – overlooked. But when it involves an international oil company like BP, well, now that is a different story. Is this not a polite manner of saying that the whole incident was contrived, planned and executed by the DRS, with its long and sordid history of false flag operations? To outsiders, it all sounds bizarre, bordering on the conspiratorial, if not downright “over the top.” To Algerians, to the contrary, it all was quite reasonable, the way things have been done in the country for decades. There were some suggestions of what the Algerian authorities hoped to gain from such an operation. The militants, directed by Algiers, would have carried out the operation, the foreign hostages seized, thus creating a major international press event that the DRS would have tried to manipulate to their own advantage – as they have done many times in the past. The Algerian government, positioning themselves as “heroes of the day,” would have then “stepped in,, dramatically negotiated their release, the world press cheering. The hostages – perhaps minus a few casualties (adds drama to the situation) would then be released to great fanfare and acclaim: The DRS had shown its mettle once again! In this age of fast-advancing technology, the whole thing could have been orchestrated, arranged by cell phone. The intended lesson: Algeria can take care of its own security issues and has no need of a greater American (and/or French) security presence in their country and in the Sahel region. In fact the whole operation could have been set up to somehow counter precisely this, in the aftermath of the chaos in Libya and the uprising in Mali. The foreign workers seized were just pawns in a game, that frankly the DRS had played a number of times before, but on a smaller scale and more successfully (using Belmoktar in fact). The difference between this operation and previous DRS foreign kidnappings/ransoms (detailed by Keenan in both of his books) was its scale, which involved many more hostages and the fact that this time it was a high-security energy complex that was targeted run in large measure by foreign world-class energy companies (whereas before it was mostly the kidnapping of French or German tourists in the desert). But someone inside the In Amenas plant didn’t follow the planned script and in a matter of minutes the whole incident blew up in Algeria’s (but specifically the DRS’s) face. Thus the opposite from what was intended was learned: for energy operations to continue smoothly in Algeria (and not just there) a foreign security apparatus needed to be put in place. The government cover-up that followed was unconvincing at first mostly to long-time Algerian human rights watchers, but in the end to Washington, London and Paris, all of whom who had been made to look like fools. Although U.S. intelligence has, as Edward Snowden and Julian Assange have shown, made a mess of things of late, in time, they got it right on this one. One can only imagine the response that resulted in Washington as the intelligence community put all the pieces of the Algerian puzzle together. The DRS had overplayed its hand and had gotten caught in the act. That DRS chief Mohamed Mediene (codename Tewfik) did not “disappear,” himself caught up in the purge, was quite curious given his likely complicity. Malti argues convincingly that it was the intervention of the Algerian generals that saved his skin. Perhaps some other thinking was at work. Stripping Mediene of his main supporters and high level accomplices essentially strips him of his power, neutralizing his influence. Now he works for the Americans who know a good thing when they see it. Besides, had Mediene been removed from power, it could have resulted in such discrediting of the entire Algerian ruling strata that the whole rotten system might very well have collapsed. Other than the Algerian people, who would have benefited from such a move? Certainly not the old military-security mafia that runs Algeria! Not even his Bouteflika – who has been a part of this system virtually all his adult life – would have benefitted. Why not simply gut the system, de-claw it so to speak, and then “turn it” so that from now on it serves Washington and its allies? Any Algerian kid on the street would understand what the Americans are up to and why. Perhaps Washington and London had even more evidence of DRS involvement than what they were able to learn from Souaidia and Keenan. After all, for five years just after the millennium, the U.S. Special Forces had a secret military base in the southern Algerian city of Tamanrasset. Apparently it was closed down after the Algerians figured out that the communication equipment given to the Algerian military to monitor “terrorist activity” in the Algerian Sahara was actually being used to spy on the Algerians, with the information collected by both U.S. and Israeli intelligence by satellite. American drone satellites are known to be in the area as well. Regardless, the Tiguerntourine incident has proven to be a useful pretext for American military/security penetration of Algeria as a part of its overall militarization of the Sahara region with its partner France. Washington has shown little to no interest in using this damning information to further Algerian democracy; to the contrary, Tiguerntourine will be a pretext for undermining Algerian economic sovereignty and its military security. It is the latest in what has been more than a decade of U.S.-Algerian security cooperation in the Sahara since September 11, 2001. Early on the United States offered that Algerian government legitimacy, a cover for the war crimes that they had committed during the civil war of the 1990s. Algeria also got some communication and high-tech military toys out of the deal. The United States, seemingly impressed with the regime’s utter ruthlessness during the 1990s, gained a new partner in its “war on terror,” greater security access to the Sahara with its great energy and mineral (uranium, gold) wealth. At the same time, Algeria has tried to limit, to control U.S. access. It is classic power politics, where, behind the high phrases and rhetoric of “fighting terrorism,” at the same time the two countries are “partners” and are both trying to use one another for different ends. Washington won this round and handily so. The DRS has suffered perhaps the most devastating blow of its existence, their credibility all but shattered. Couldn’t happen to a nicer bunch of thugs. Still, it is too early to rule them out as political players. Their reach is long, their experience, when the story comes to life, as insidious as any. For decades, they were able to finesse their relations with France and run French-Algerian policy in a way similar to how AIPAC runs the U.S. Congress on support for Israel. But now they are dealing with Washington whose political acumen the DRS seemed to have under-estimated. As usual while some of Algeria’s generals and intelligence officers were “retired” and can no longer dip into that great cash cow which is Algerian energy, in fact they are getting off easy. Those involved should be indicted for war crimes, crimes against humanity. They are already millionaires. It is, once again, the long suffering people of Algeria who lose – they lose twice in fact – first from only seeing the smallest modicum of justice being meted out to the mafioso who have run the country for so long and second, because, having had their wealth first robbed by their generals and intelligence officers, now it will be taken by international energy cartels. 1. Habib Souaidia, a former Algerian intelligence officer now based in Paris. He is the author of La Sale Guerre, a damning condemnation of the role of the DRS (and the Algerian military) in the Algerian civil war of the 1990s. Jeremy Keenan is a British anthropologist with great – if not encyclopedic – knowledge of the Sahara and its peoples. He has authored two books detailing the role of Africom and U.S. militarization of the Sahara (to secure oil, natural gas, uranium, etc): The Dark Sahara and The Dying Sahara. (2) On some level, admittedly it is impossible to conclusively prove that the whole thing was a DRS plan gone awry. But it certainly “smells of that.” Furthermore, nothing is more suggestive than looking at who in the Algerian power structure was removed from power. What undermines the hypothesis, frankly, is that the whole affair was exceedingly dumb – if not outright stupid. Could the DRS do something that was so poorly conceived? I believe so – this happens when arrogance, ideology and greed combine; this particular cocktail has long characterized DRS activity. Add to this that in the past, the DRS has – as we say in English – “gotten away with murder” so many times that they begin to think that they are invulnerable, a fatal error. Rob Prince, whose teaching title has changed five times in the past 20 years, although the job is the same, is Teaching Professor at the University of Denver’s Korbel School of International Studies. In recent years, he has written extensively on North Africa. He is also the publisher of the Colorado Progressive Jewish News.